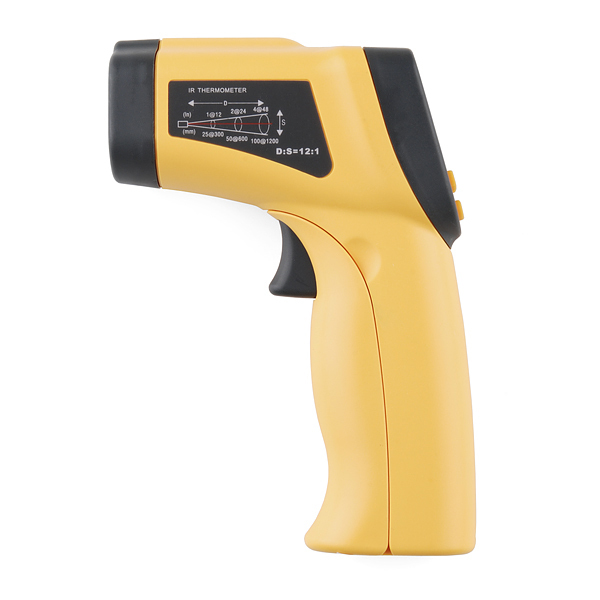 This non-contact infrared thermometer makes it a breeze to take quick and accurate surface temperature readings without getting too close for comfort. 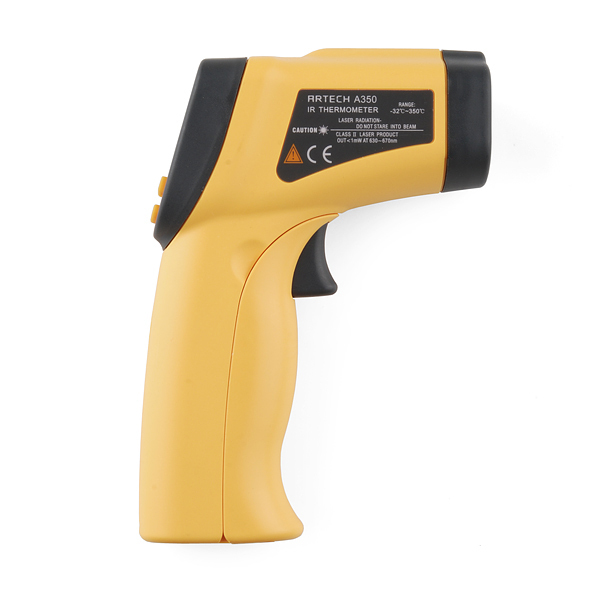 Laser sighting ensures that you're pointing at the right spot: Simply pull the trigger and line up the laser dot where you want to measure the temperature. 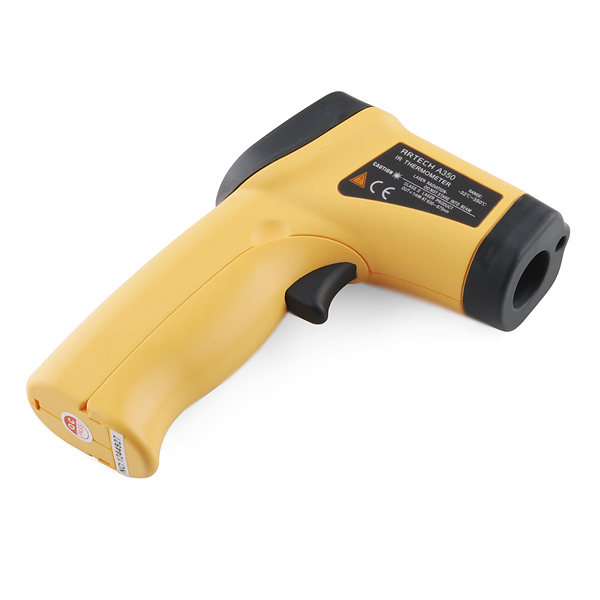 The temp gun also has adjustable emissivity compensation for measuring the surface temp of more or less radiant objects. Begin by taking the battery cover off. It snaps off at the hinge. Removing the battery cover reveals a screw by the trigger, as well as another screw where the hinge was. There are two grey plastic pieces; one covers the display and keypad, the other covers the front of the "gun" part. Both of them are held in place with plastic tabs (no screws). After they are removed, the two halves of the yellow housing will snap apart (they are also held together with tabs). In practice, I was unable to pull off the front one grey piece, so I only took the back one (that covers the display and keypad) off, and then pulled the yellow housing apart carefully, starting at the battery case and working towards the front of the gun. Inside of the housing is a single PCB. The microcontroller is under a blister pack, so would be hard to hack. There is a debugging(?) connector with 6 through-hole pins for headers (non-populated), as well as a two-pin header labeled "CAL". There is also an IC labeled "93c466," which may be an EEPROM, but I'm not sure. There is a pushbutton which the trigger hits, and four contacts for the membrane keypad. The display is inside a clear plastic housing, and connects to the PCB via a ZEBRA connector. The IR sensor is in a huge black housing screwed to the PCB (which I didn't take off). The laser pointer is stuck in a mount on top of the IR sensor with some epoxy, and has two wires which are soldered to the PCB. Other than the blister pack, most components on the PCB are 0805 surface mount, so it should be easy if anyone wants to reverse-engineer most of the circuit. would it be possible to hook wires to the pins in the battery terminal to "read" the temperature using an Arduino? looking to automatically write temperatures to a log file when a measurement is taken. That's entirely dependent upon the function of the 6-pin connector I found, and whether there the firmware implements a communication protocol. I don't know the answer to either of those questions. Just curious... what's your application? 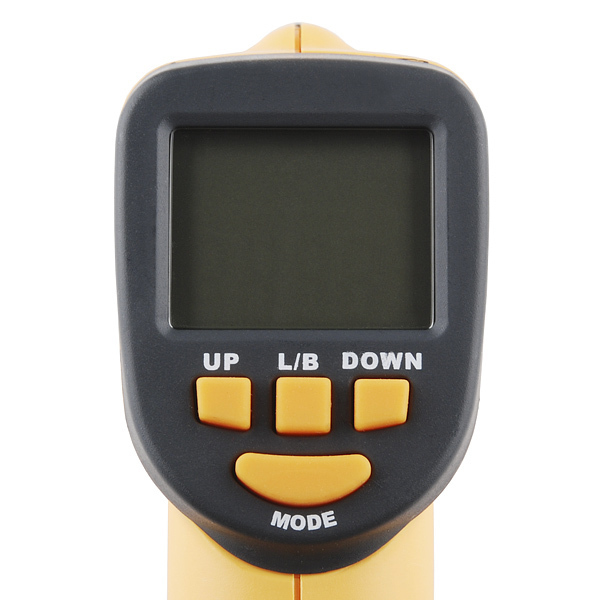 Do you need non-contact temperature readings? Wow, my $55 IR thermometer doesn't have emissivity compensation. I wish it did! I can't properly measure the temperature of a hot pan with cooking oil in it. It bothers me! Works great, although I think my laser alignment might be a little off. Emissivity does make a difference. Any idea what the hardware in these guys is? we have them on order and they have shipped. we're just waiting for them to arrive. maybe another week or two? 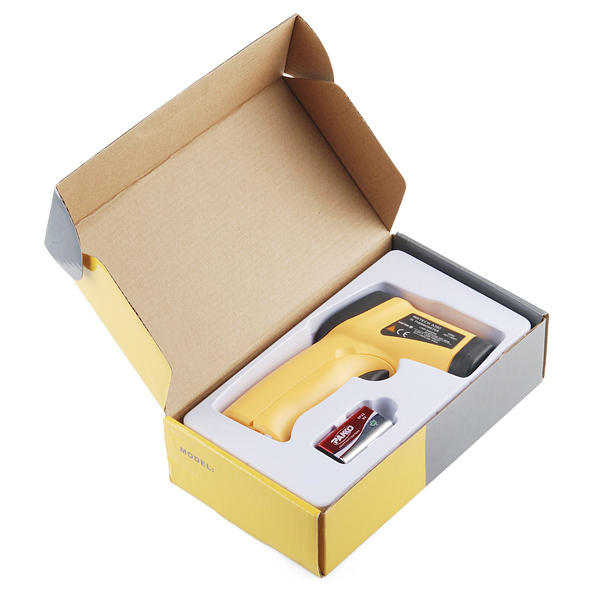 Does anyone know if it is possible to just buy the case of this Non-Contact Infrared Thermometer ? Because I plan to build my own hardware with very accurate (and with a FOW of 10 to 20Â°) MLX chipset and a low power PIC or MSP430 chip with a good laser diode and a display. The aim is to check in real time Hot Air reflow temperature (to be compliant with IPC/JEDEC J-STD-020C reflow profile) with output on usb or rs232 to connect and have realtime temperature on a computer. You might check Alibaba, If not this exact case, you will most likely be able to find something similar. Any suggestions for cracking this open as a part for the "Cheap Thermocam" from tuesday's news? I'd consider it on some other thermometer gun, but not this overpriced one. Not sure what makes this overpriced. Maybe they're cheap online, but when I needed one I had to spend $55 at Frys. Suppose I wanted to crack it open, as I know many of us do... I'm guessing that the output from the infrared sensor bit is analog, right? I have one from dealextreme, it has a laser in it but the laser goes straight and than if you try measuring temperature of a qfn ic for example you do not know where it's measuring because the laser does not point the place it's measuring it points a bit on top of it, I don't know if this one is the same but it looks a lot more reliable for just a little bit more $... it has all the same properties btw, but not adjustable emissivity compensation and alarm. It looks like you have some character encoding problems in the product features ("Ã¢âÆ"). Works as advertised and easy to use. Have used it to check heat sink temperature in a electronic load design. It's quick, has nice settings, comes with the required 9V battery, and has several settings. Fun to point at random things to measure their temperature. The laser can be turned on/off, which I think is a really useful feature.